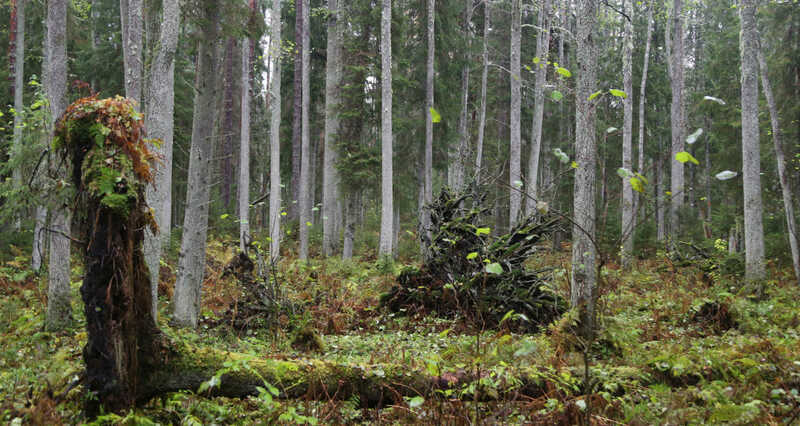 With over half of the country forested, Estonia is Europe’s greenest country and the world’s 8th greenest country. 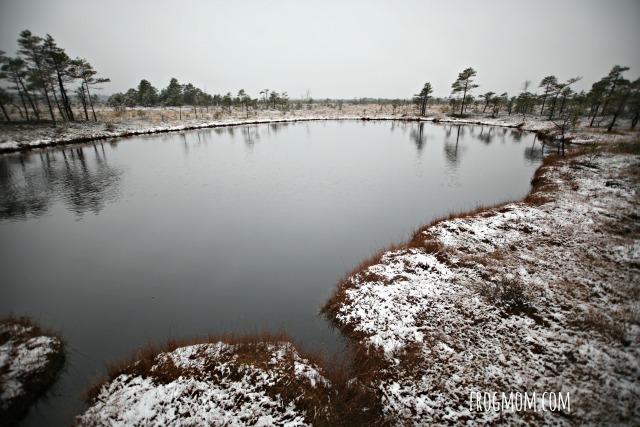 To get a taste of true Estonian nature, head to Lahemaa National Park, Estonia’s largest national park only an hour from Tallinn. From giant sea boulders to quaint fishermen’s villages or moose-roamed spruce forests, Lahemaa National Park has a lot to offer for the whole family, including gorgeous fairytale mansions and forest boardwalks through pristine wilderness. 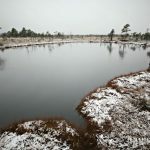 We visited Lahemaa after exploring Soomaa National Park, thus enjoying a typical Estonian bog adventure during the same trip. 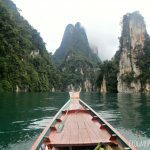 To visit Lahemaa National Park over two days, we packed picnic lunches on both days so that we wouldn’t have to stop at lunch time. It proved a good time-saving and budget-friendly strategy, as our hotel’s breakfast buffet provided cold cuts, sliced bread and fresh fruit for breakfast and as we were able to access remote sights without having to look for restaurants at meal times. 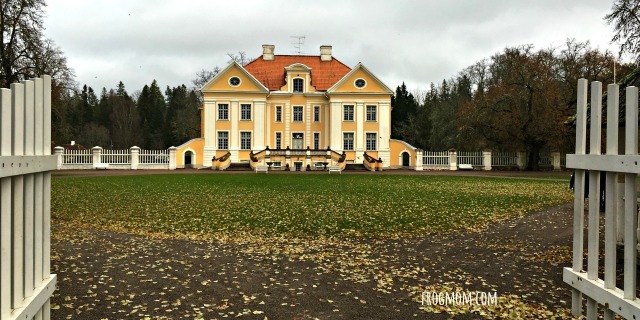 Our first stop at Lahemaa National Park was Palmse Manor, a historical baroque manor house that’s been beautifully restored and is now a house museum. When we visited, we were the only ones walking around the manor’s stately rooms and with the guidance of the period-dressed host, we got a glimpse of what life must have been for the von der Pahlen family in the 18th and 19th centuries. Upstairs, my girls got a kick of the amazing dress-up wardrobe complete with crinolines, fake fur capes (a la Doctor Zhivago) and buttoned vests. On the basement floor, we were treated to a demonstration of a Victorian cylinder music box in a cabinet, a great piece of machinery whose twinkly sound added to the genteel atmosphere of the house (cue a War and Peace rural chapter). Downstairs, we enjoyed the kitchens but mostly, we looked with envy at the tavern restaurant that only opens in winter. Though it was closed, it looked very inviting. After walking around the grounds with other fairytale cottages by the lake, we made for the Lahemaa National Park Visitor Centre in the stables. There, a very helpful woman who spoke perfect English showed us a few hiking and visiting options on a map and we were quickly on our way. 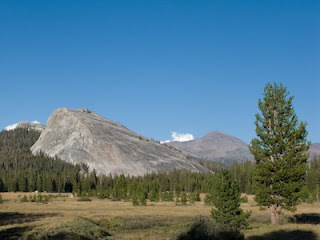 We love to hike and Lahemaa National Parks offered many well-marked trailheads with maps and interpretive signs along the trail. 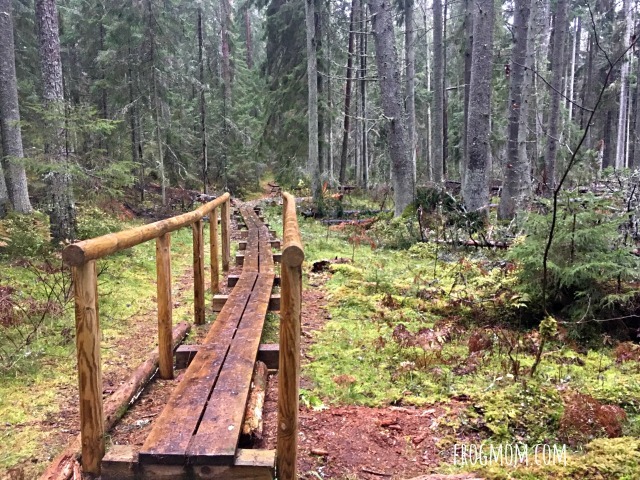 We picked the Oandu-Vosu Hiking Trail, a 4.7 km easy loop, because of the possibility to sight moose in the lower part of the forest. We don’t see moose very often (if ever) and to know that a few individuals might be roaming within 20 miles of us was exciting. 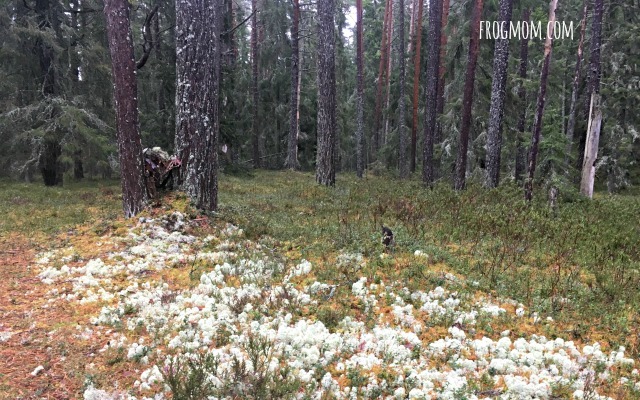 If you’re a big game and wildlife enthusiast, Lahemaa is truly a gem because the national park is home to populations of European lynx, wild boar, brown bears, moose and wolves. Where else can you see such fantastic animals in Europe? Not too many countries, I gather. 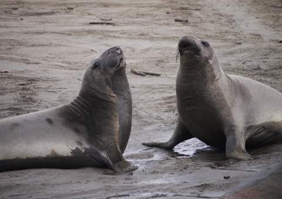 Though you’re unlikely to see them because they’re elusive, these animals show that this wilderness is as alive and healthy as any national park in Alaska or the Pacific Northwest. In the end, we didn’t see any wildlife but we saw many signs of moose activity–pine trees polished or peeled with antlers during feeding, trees with clipped offshoots, or just split trees. Turns out, moose are quite gourmets and eat many types of trees (willows, aspen and pine) in Lahemaa National Park. 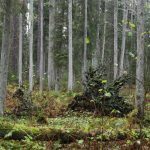 The fun part, for our girls, was following the interpretive signs (in Estonian and English) with explanations on mosses and plants, inhabitants of tree hollows or elks. In the old aspen part of the forest, the atmosphere of the mossy woods was so primeval that we couldn’t help stopping to build a fairy house between two tree trunks. You’ll find it lodged between the two pine trees in the left part of the picture, hopefully nature-compliant. We used lichens, mosses, dead branches and bark pieces torn by moose to create a temporary nature home for woodland creatures. Lahemaa National Park is both a nature and a cultural escape, as it features protected ecosystems as much as protected ways of life. 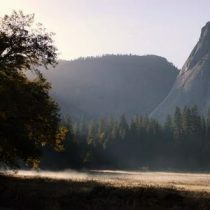 That’s why some villages are part of the national park’s highlights. Known as the Captain’s Village, the tiny coastal village of Kasmu hosted a Maritime School from 1864 to 1931 where many of Estonia’s sea captains were trained. Before visiting the village, we parked at the northern end of the village (the end of the road) to hit the Kasmu Nature Trail. 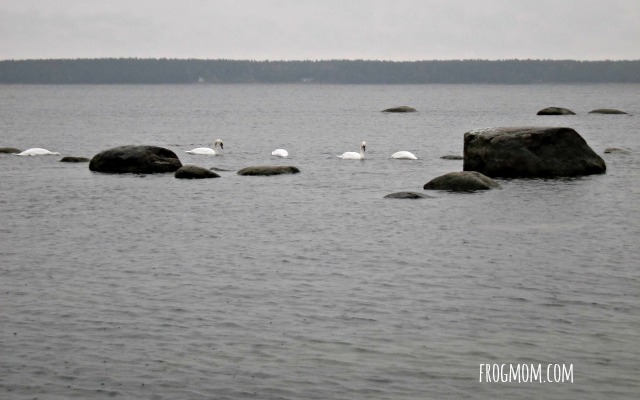 Within minutes, we reached the coast and were amazed to find a colony of swans floating on the sea between erratic boulders. Though the picture doesn’t show it, the water was crystal clear in shades of greens and we would have loved to dip our toes to feel the fine sand underfoot. A cold Baltic wind pushed us to wrap our layers even more tightly as we walked along the narrow peninsula to its very end where a narrow causeway leads to the island of Kuradisaare (Devil’s Island) when the sea is low. 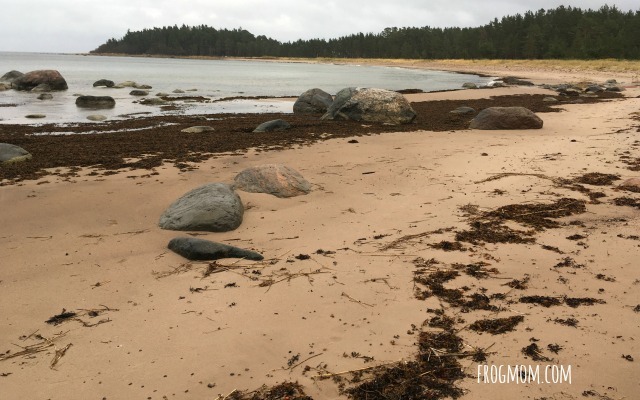 Because of flooded portions, we couldn’t completely reach the island but just walking on firm wet sand between boulders was beautiful. We retraced our steps to the coast and walked through the forest, following the well-marked trail back to our car. Next stop, the private maritime heritage museum or Kasmu Sea Museum. The owner, Aarne Vaik, is a grandfather with an impressive archeological diving background (he discovered many of the items exhibited, including viking weapons and tools) and his brother was a national open water swimmer for Estonia (he showed us a medal with a time of 20 minutes for a nautical mile, a feat even by today’s standards). 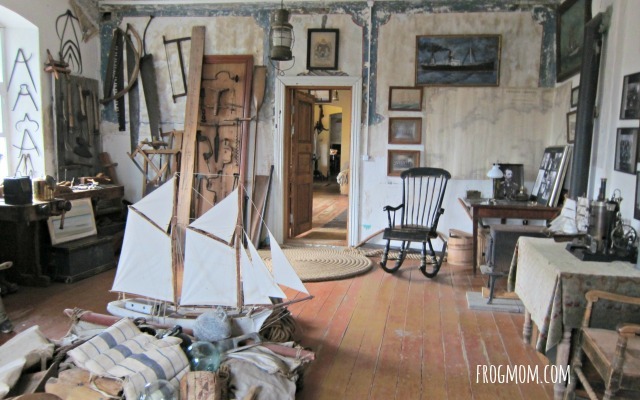 As we were the only ones in the museum, Aarne welcomed us to his home and took us around all the rooms, each crammed to the gills with maritime memorabilia and interesting artefacts. 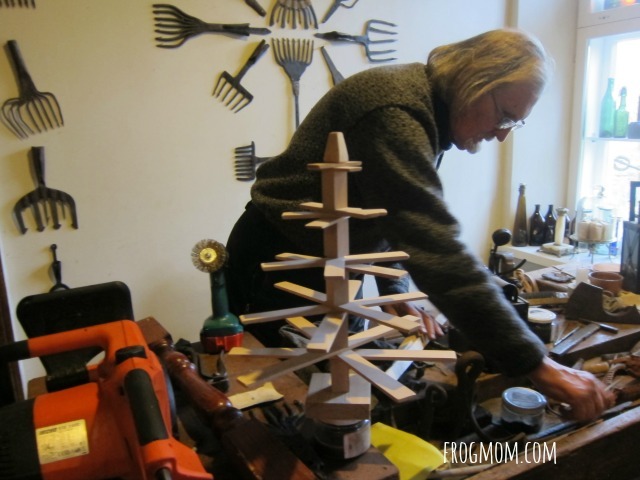 In the workshop space, I was fascinated by a “sailor Christmas tree,” a wooden tree with folding branches made to support tea candles, and Aarne was kind enough to show me how it was done. He was making it to prepare a kids’ crafts day in December and I dutily took measurements and supply list to replicate it at home (it’s on my to-do list). We didn’t visit the outside of the museum (poor weather), but my girls loved the collection of maritime exhibits. It’s a lovely old house and a must to get a feel for Kasmu’s history. 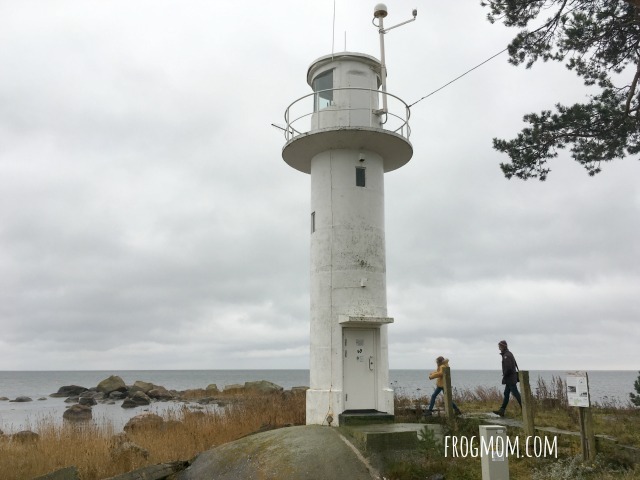 Vergi lighthouse could easily be on this list of kid-friendly lighthouses around the world. 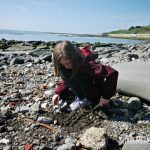 It’s tiny–compare it to the size of my 13-year-old daughter with the yellow jacket–and only a short stroll from picturesque Vergi, a fishing village renowned in the 19th century for its eel fishing places. The lighthouse’s white concrete tower dates from 1936 and at only 10 meters high, is very human-size and almost miniature. It’s too bad that it’s surrounded by a fence next to an abandoned building, as it deserves to be better showcased. Incidentally, we found near the lighthouse colonies of puffballs, round mushrooms that release brown clouds of spores when you step on them. Delighted, my girls had a blast jumping hurdles between puffballs. 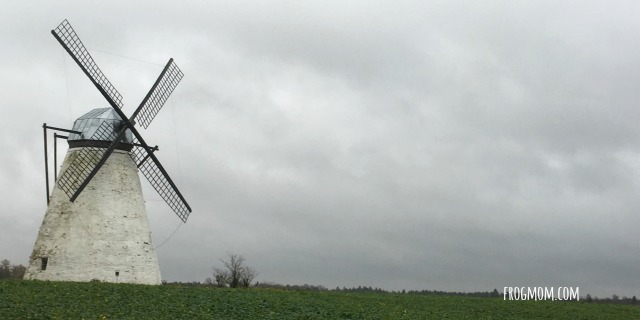 The Vihula Windmill is a landmark that signals guests of the elegant Vihula Manor Country Club & Spa to get off the road from Karula to Sagadi and go down the tree-lined alley to the restored manor buildings. As with other manorial estates in Estonia, Vihula Manor included in its heyday many working buildings such as a farm, a vodka distillery and in this case, an 1860 Dutch stone windmill. If you are a guest of the hotel, you can ask the windmill’s key at reception and walk up the stairs to the viewing platform. 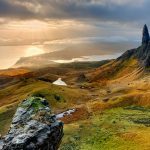 Alternatively, you can also get fantastic views from the road, both by day and by night, as it is very well illuminated in the dark. The picturesque fishing village of Altja features some of the best-preserved country buildings in Lahemaa National Park, some abandoned, some restored, some private and some open to the public. 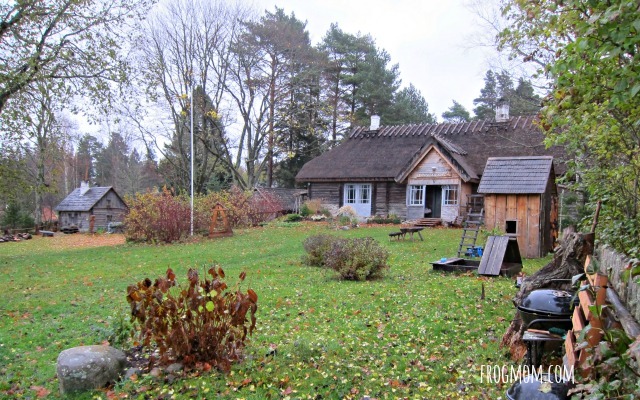 If you have an hour, stop and take a walk through the village to the beach and the forest, try the Estonian (adult-size) wooden swing while singing a folk song (it’s tradition) and have a meal at Altja Korts, a log cabin tavern that serves fresh and seasonal local food. If you do one thing at Lahemaa, take a walk along the coast. Here, the Baltic Sea is all that separates you from Finland some 70 km away and you’ll hardly see anyone else on the pristine fine sand beaches. 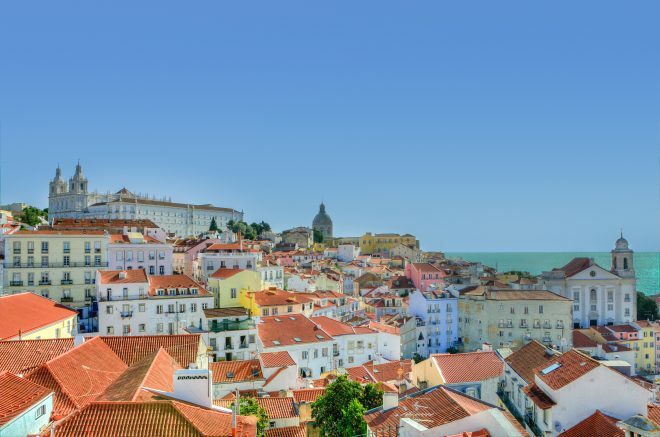 Jagged and dramatic, the coastline is a real breath of fresh air and you’ll come out reenergized. 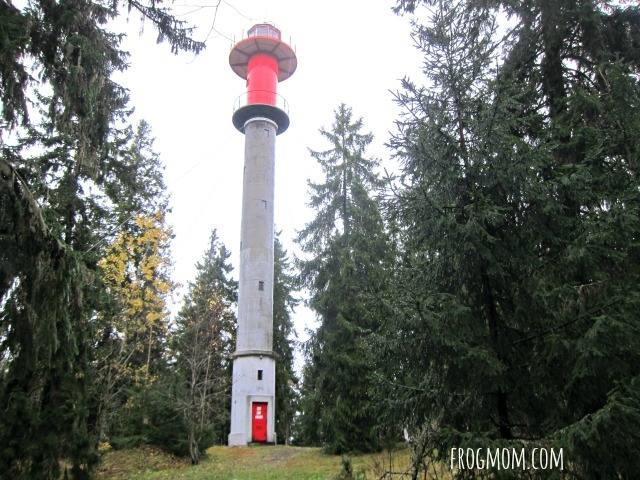 Yet another one for the lighthouse collection, Juminda Lighthouse cuts a striking white and red silouhette in a dark pine forest, a stone’s throw from the northern tip of the Juminda Peninsula. 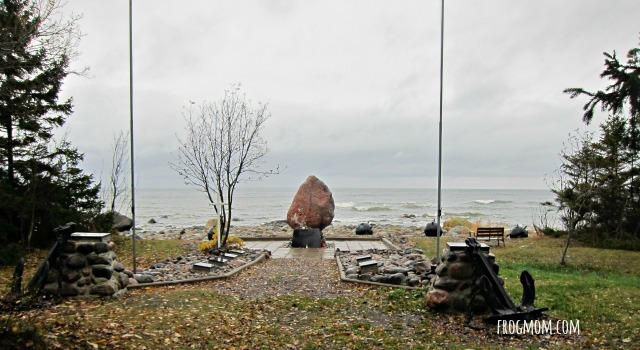 It is closed to the public but if you walk down to the beach from the picnic area (with a great picnic shelter and barbecue), you’ll see an important Estonian memorial and learn about an obscure WW2 naval disaster that bizarrely never made it outside of Estonia, despite the immensity of the human tragedy. If Estonia had a Titanic, this would be it or it would be 8 Titanics, as 1,500 people died in the sinking of the RMS Titanic and over 12,000 people died on August 28, 1941 off Cape Juminda. The simple memorial on the beach features a series of marble plaques engraved with ship names leading to a standing stone behind a line of sea mines. The scene pretty much sums up what happened but for history buffs, here’s what I’ve gathered. The naval disaster of August 1941 struck during the Soviet evacuation of Tallinn, when an armada of 195 Russian ships divided into four separate convoys left the city of Tallinn at night to evacuate pro-Soviet civilians and troops. Out at sea, the convoys formed a line 15 miles long. The Gulf of Finland at this time was probably the most heavily mined area in the world, with approximately 60,000 mines laid by Germany, Finland and the Soviets. Around 10pm, the convoy sailed straight into a minefield. Between sea mines, German bombers and Finnish coastal artillery, a total of five destroyers, two torpedo boats, a patrol vessel, three minehunters, three submarines, two gun boats, two smaller warships and fifteen transports were lost that night. Though it’s the biggest sea mine disaster of WW2, this tragedy is not even recorded on Wikipedia or many other WW2 websites. It’s baffling and all the more reason to say a prayer for these lost souls when you visit the site, regardless of whether you agree with that part of History or not. 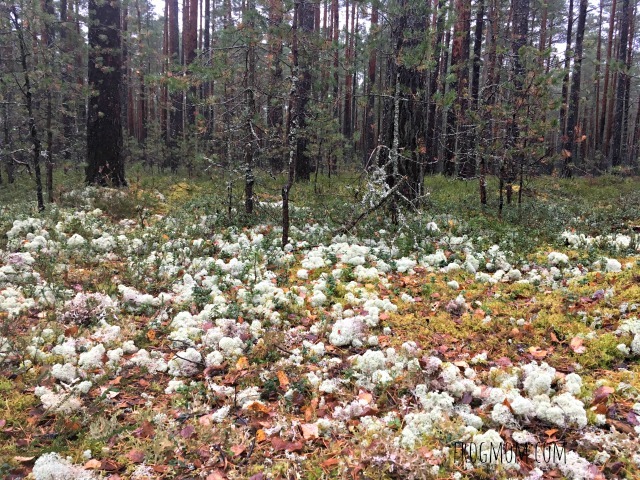 Lahemaa National Park is about 50km from Tallinn on the highway between Tallinn and Russia. It is a very good road and you can easily get out of Tallinn to explore Laheema as a day trip with a rental car. You will find free maps at the Visitor Center or you can use this post as a guide to create your itinerary.